Looking SE at wet diggers from SW corner of cottage. Sunday’s dig ended with torrential rain, though fortunately it stayed dry until afternoon tea-break, so some good digging managed to be done. Looking N at approx location of E wall of S extension of cottage. We now know for sure that the east wall of the extension (to the south end of the cottage) has been lost. Its approximate location was only discernible from the changes in the texture and structure of the soil fills, and the contours of their horizons. Inside the extension there is a compact chalk rubble fill. Outside, is a less compact fill, a mix of garden soil and a relatively small quantity of demolition rubble, the base of which is at a slightly lower level. Unfortunately the rain has muddied the horizons between the fills. 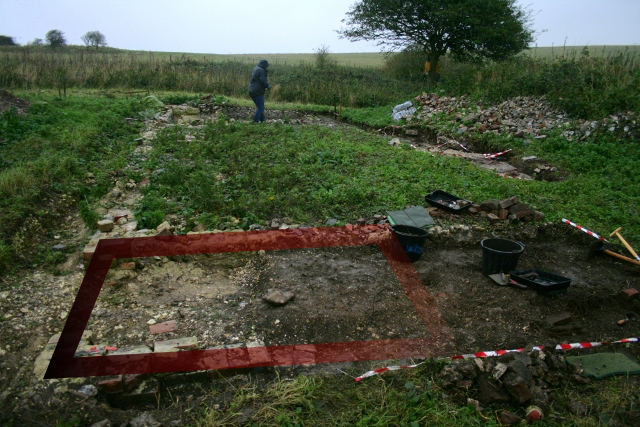 Therefore it has been decided to remove the chalk rubble fill, down to the mortared base on which it sat, to better reveal the extension’s outline. The bottom of the fill outside the building, as with the north and east sides of the cottage, is characterised by a higher quantity of window glass, roofing slate and other finds, but their distribution seems to be patchy. Perhaps the ground surface was disturbed by WW2 ordnance such as mortar fire. This would help explain why one end of the twisted wire handle found earlier was partially buried under a sub-soil fill. 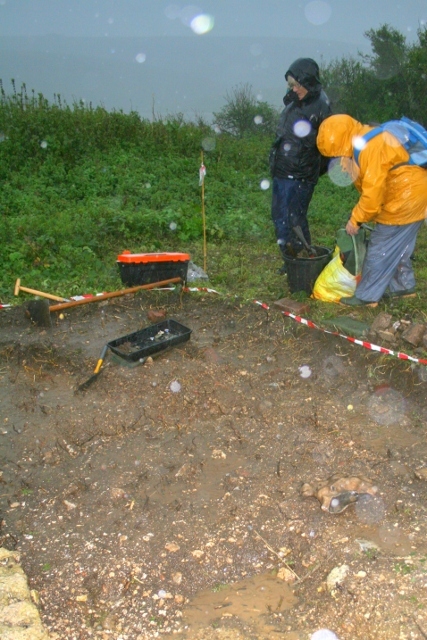 There is no sign of any well as yet, but this area as not yet been completely excavated. One of the best finds of the whole dig was our first teaspoon – electro-plated nickel silver – until a second decorated one turned up shortly after; also new was a small plastic (pvc?) dolls arm; and – another first – part of a sacrum(?) bone from a fairly large animal (hopefully not human). Otherwise finds were similar to those found previously and included; a .303 cartridge fired from a bren gun, a fair amount of window glass, just a few fragments of ceramics – all with a decorative glaze, and a very few rusty nails. Work on site is now planned to happen whenever there is dry weather forecast and we are available to dig. However, at present, family commitments prevent me from being able to say in advance when this might be, other than our usual Fridays and Sundays – weather permitting. We would love you to join us – no experience required. We meet at the car park near the junction of Bexhill Road and Falmer Road, just north of Woodingdean, at 10am. Please don’t hesitate to give me a call for further info. 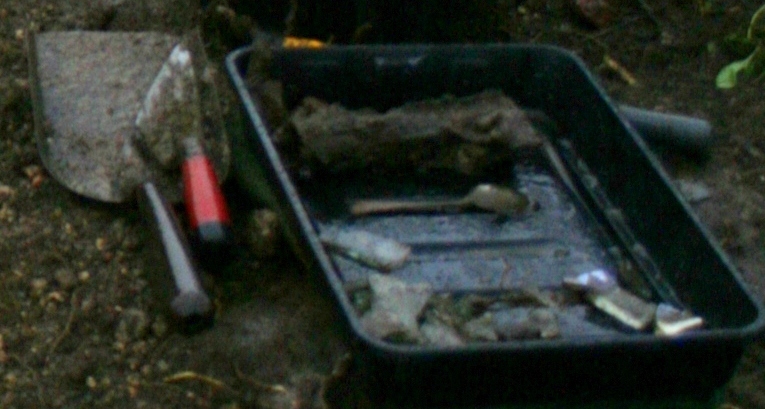 One of two finds trays from just S of S extension of cottage. It has been pointed out I had missed describing one of our finds. Oops! To be honest, though it had been speculatively named as a stirrup pump, and about three of them – or something very similar – have been found before, I had completely forgot about it when writing this entry, probably I had too much else on my mind at the time. I have now done some more research. It is a rusty iron hollow cylinder, about 3cm diameter, and about 18cm long. One of the ends is flared; the other end seems to have 2 pairs of opposite facing fin-like brackets/flanges, the longest projecting out by about 2cm and tapering down over a length of about 7cm. Images and descriptions of stirrup and other pumps from WW2 (the most likely date judging from its context in the demolition rubble to the north of the cottage) were of brass, and the shape of their ends did not match what we have found. So it remains a mystery. How might it have been used? Where might it have been used (either here and elsewhere)? Why was it found here? A wide range of experts, museums, books, and the Internet will be used.